During a session on September 4 at the Light on the Path retreat, Lama Zopa Rinpoche taught on several topics, including continuing a translation of Nagarjuna’s Praise to Satisfy Sentient Beings. From that, Rinpoche spoke to participants about the importance of working at Dharma centers. What follows is an edited version of Rinpoche’s advice on serving sentient being through working for an FPMT center. 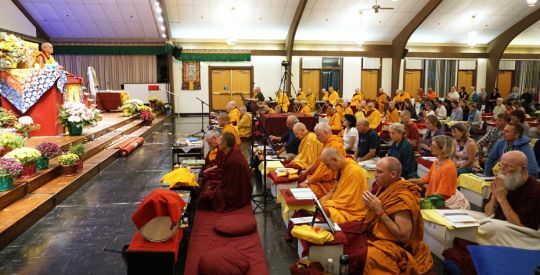 You can see that working for the FPMT organization, working for the Dharma center wherever you are, is not just physical work—making a road or building a house or something. (Although even that can be for sentient beings!) Do you understand how bringing the wisdom light of Dharma to the minds of sentient beings—which are like a dark room where they have suffered continuously without end since beginningless rebirths—is so important? How bringing the light of Dharma to the darkness of their hearts and minds is so important? In the center, whatever you are doing—whether you are the director, the assistant director, the bookkeeper, the cook, the cleaner—is for sentient beings. You are working for sentient beings. You have to keep your mind as Buddha explained and as Nagarjuna explained in Praise to Satisfying Sentient Beings. What you are doing and what has been explained is the same, not opposite. So, think in your heart about sentient beings. Then, work and benefit sentient beings through whatever work you do. That is what is most pleasing to Buddha’s holy mind. That is what is most pleasing to numberless buddhas and bodhisattvas. It is most pleasing to the guru—His Holiness the Dalai Lama, Lama Yeshe, and so forth. Do you understand? Working for sentient beings is most pleasing to them. Do you see now what is being talked about here in Praise to Satisfying Sentient Beings? 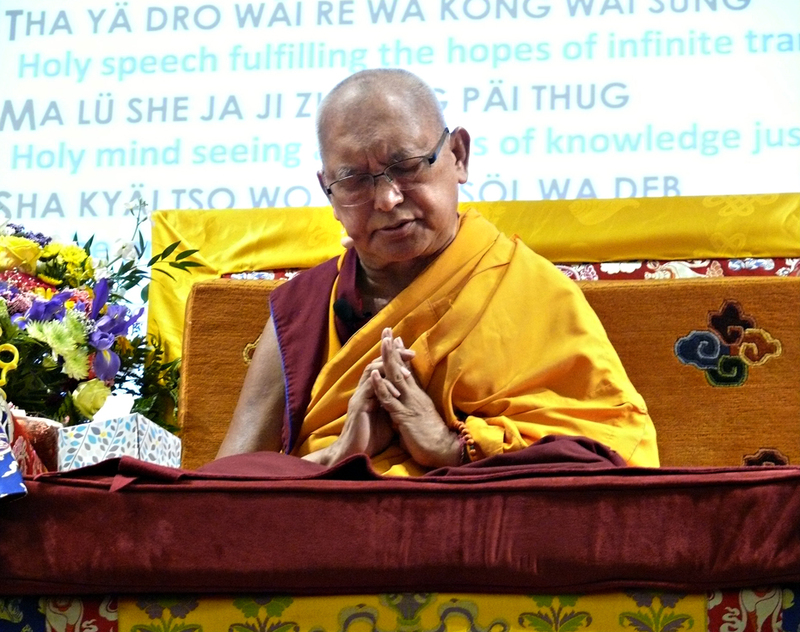 Lama Zopa Rinpoche teaching at Light of the Path, September 2017. Photo by Ven. Lobsang Sherab. In an FPMT center, there is a resident teacher who teaches lamrim philosophy—either simply or complexly—whatever is needed. If he or she doesn’t speak English, then a translator is provided. And nowadays, even the Western students themselves are able to explain and teach. Before, we needed geshes. Now that the Masters Program and Basic Program are running, lay students teach philosophy, even in centers where there are geshes. FPMT developed this. But to have all that, you need facilities—you need many things. So, you provide those things. And you need all that to help sentient beings, to help yourself and to help others. Between the body and mind, everyone at the Dharma center is there to help the minds of sentient beings. By running the center with the mind of Dharma—correctly following the virtuous friend, renunciation, bodhichitta, and emptiness (without even talking about tantra)—whatever you are doing there, whatever the center does becomes virtue. Everything becomes the cause of achieving nirvana and nothing becomes the cause of achieving samsara. Everything becomes the cause of enlightenment. Everything becomes the cause of enlightenment if the main effort of everyone working in the center is put into cultivating a bodhichitta motivation. This is the best way to benefit sentient beings. To bring about world peace, the basic thing needed is for people to learn about and develop compassion. Basic Dharma is compassion. If you create negative karma, if you harm other sentient beings, the result is that you will be harmed for hundreds, thousands, and millions of lifetimes. If you benefit others, then you will have success in your life for hundreds, thousands, millions, and billions of lifetimes—it goes on and on. All happiness comes. At the Dharma center, you teach basic Buddhism: compassion and wisdom. Therefore, students come to know about karma. They abandon negative karma, which causes suffering, and create good karma, which brings happiness. Dharma centers bring so much peace and compassion to the world. They teach compassion and wisdom. They teach what is right and what is wrong. From that which is right, comes all happiness up to enlightenment. From that which is wrong, comes all the sufferings. That is why students need to learn Dharma. And not only lamrim, but philosophy too. At Light of the Path, Ven. 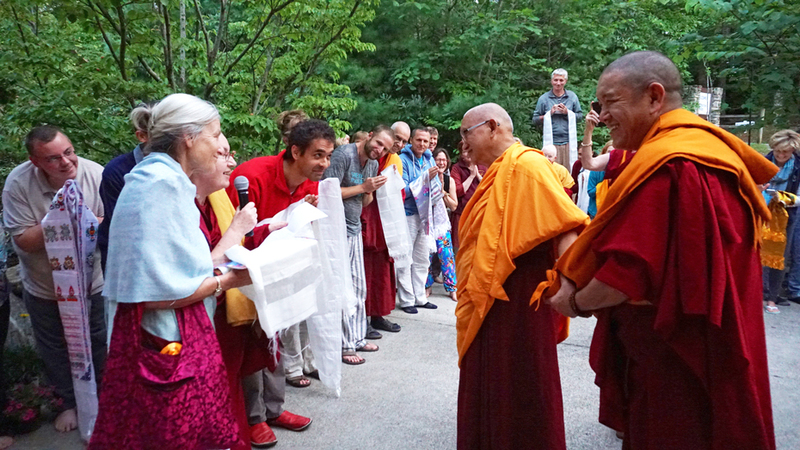 Chantal Carrerot, Paula Chichester, and Alexis Benelhadj request Rinpoche to give a Vajrayogini retreat at Institut Vajra Yogini in France, September 2017. Photo by Ven. Lobsang Sherab. So, the centers are sooooo important. The centers are where sentient beings are allowed to learn Dharma and to meditate. Centers are where there are facilities, teachers, translators. They are so, so, so important for sentient beings. You cannot imagine how important they are, how needed they are. In the centers, everything that is done is for sentient beings. Can you imagine? It’s so important, so important, so important. By remembering that you are involved in this, you should always be happy. As I often say, I thought people who had won at soccer were angry—because they weren’t smiling; their veins pop out they raise up their arms! Later, I realized it meant that they were unbelievably happy. But that’s nothing. That happiness is nothing because it doesn’t protect them from the lower realms. For us, we have to be joyous nonstop like a soccer player who has won a match. We have to express our joy—with our arms raised—day and night, all the time, every second. People might think you are crazy because you aren’t playing soccer! If you are defeating other people in a match, it’s OK for you to raise your arms, but because you aren’t defeating other people in a match, they think you are crazy and should go to an institution. In reality, you are making so much merit, so much happiness in every second—it’s unbelievable, unbelievable. You are following the guru’s advice and fulfilling the guru’s holy wishes, which collects the highest merit. Whatever you are doing while working for the center collects the highest merit and is the greatest purification of negative karma collected since beginning rebirths. You have to recognize that. Excerpted from Light of the Path 2017, Blue Ridge Mountains, North Carolina, United States, September 4, 2017. Edited by Mandala for FPMT.org.